I’ve been a musician for over 48 years, as well as being a full time music teacher for well over 25 years. That experience, plus my own passion for music, means I firmly believe that music making should be fun - and that’s fun with a very big capital F. Even if you’re really serious about your music, perhaps to the extent of considering it as your future career, it should definitely still be fun. If it isn’t fun when you’re playing, there’s something wrong somewhere that needs to be addressed, and if you’re not having fun when you’re learning, your teacher needs to know - immediately! I try to make sure that all my teaching is carried out with this in mind. Boring, stodgy lessons are definitely out and, whilst of course teaching remains the number one priority, many a lesson has erupted into fits of laughter at some point! As one young student once told me, I’m not like her previous ‘old fashioned’ teacher. Andrew and a young exam student. I teach piano, in classical and modern styles, electronic organ, electronic keyboard, music theory and music technology. 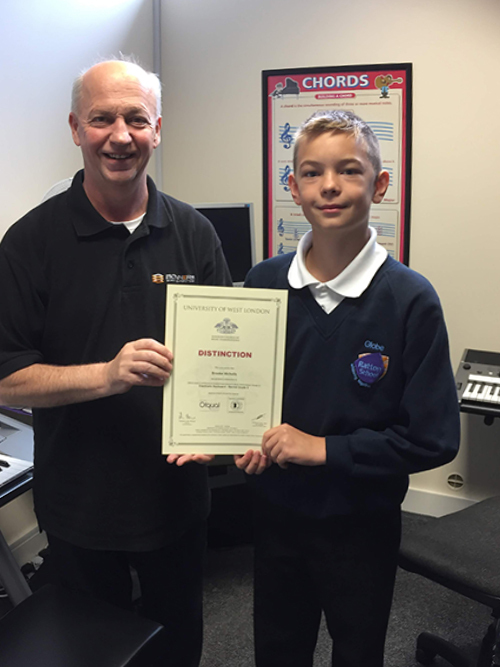 Given my background in the industry and my work with some of the very first keyboards to come onto the market, it’s perhaps not surprising that I’ve become something of a specialist in electronic keyboard teaching, I’m not just a piano teacher who either ‘dabbles’ with it or reluctantly tolerates it. A modern electronic keyboard can be an amazing instrument if it’s played and taught properly! Music technology includes basic synthesis techniques, recording methods and many aspects of computer music making. I specialise in using Cubase and Sibelius software and can help you set up a basic home studio based around these packages. Many of my more advanced keyboard students will also be studying some music technology, linking their instruments to their computers to produce stunning multi-track performances and high quality printed scores. All my instrumental teaching is properly structured, with aspects of theory, aural work and sight-reading routinely built into the learning process of new pieces of music, rather than being left until later - or perhaps never being covered at all! If you want to take exams you can, but they’re never compulsory, as I believe that they should always be milestones, not millstones! I also flatly refuse to go in for what I term ‘certificate chasing’, where a student does nothing but take exams, one after the other. (I’ve occasionally taken on new students whose entire experience of a given grade has turned out to be just the three exam pieces and scales!) I use the syllabuses of both the Associated Board and the London College of Music for piano and theory, and London College of Music exclusively for keyboard. If you do choose to take exams, then you can rest assured that I’ll be supporting you all the way, and you’ll be pleased to know that my students have a 100% success rate, with more than 90% of them passing with Merit or Distinction. Marks above 90% are by no means rare and my ‘student high scores’ are currently 99% in a theory exam (the candidate didn’t know whether to be delighted or mad with herself for missing that last mark!) and 97% in a practical exam. With me, there’s a big emphasis on musical performance, as merely playing the notes in the correct order doesn’t really make the music come alive. Piano players will learn the art of ‘reading between the lines’ of what is written, interpreting the piece their way, and putting their own ‘stamp’ on a piece. Contrary to what you might think, playing a piece ‘as written’ for a piano exam does allow for some stylistic interpretation and it’s often rewarding to ‘bend’ a piece just a little more than that, purely for fun! Keyboard and organ players will go further still, learning the arts of orchestration and arranging, and they’ll be using everything that their instrument has to offer. All of this will come in handy for exams, competitions and concerts, as well as playing in front of Mum, Dad, relatives, friends etc! Whatever you want to learn, you’ll find that there are almost no age barriers as far as I’m concerned. I have students as young as 5 progressing with their piano and keyboard studies and, at the other extreme, I have several students in their 80s busy playing organ, keyboard and piano! I make sure that all of them are getting a lot of enjoyment as they learn.